On 26 September a group of Snow Whites will occupy the city hall of The Hague. This performance by the French choreographer Catherine Ba� will be accompanied by a sound and video installation on the adjacent Spui Plein and an exhibition in , a temporary exhibition space nearby. The Hague - widely known as the world capital of peace and justice - is celebrating 400 years of international law with the Mare Liberum festival, named after the first treatise on international law published in this city by Grotius in 1609. But 25 and 26 September are also the dates of the yearly festival �beyond art� Todaysart, which is dedicated to the theme of conflict this year. 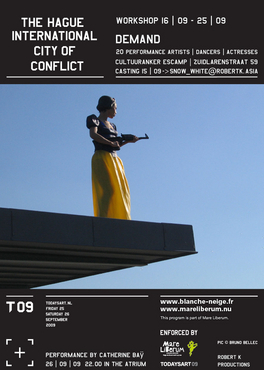 Ba� �s Snow Whites will embody the tension between the law and the conflict it purports to solve. Seated around a conference table in the middle of Richard Meier�s spacious white town hall, their mediation efforts will be disrupted by tensions building up in and around the building. Images shot during previous performances and a sound installation will be part of the choreography, but also extend outside on the square in front of the city hall. The installation will be visible during the two days of the festival, and then move to the city library for another three weeks. During the same period a video installation by Catherine Ba� will be shown in . This space will feature an artists talk including the choreographer. Performance on Saturday 26 September at 22.00. Location in the atrium of the City Hall of the Hague. Entrance requires a Todaysart pass available on the square outside. Installation visible starting 18.00 on Friday 25 September. On the Spui Plein.